Readers of a certain age (i.e. my own or older) will probably recognise that the main title of this ShukerNature article of mine is a totally shameless parody of the title from a famous comedy song released in 1938 by the much-loved British war-time singer Gracie Fields, the song in question being 'It's the Biggest Aspidastra in the World!' (I know, I know, but it was just too fantastic a pun to let pass!). 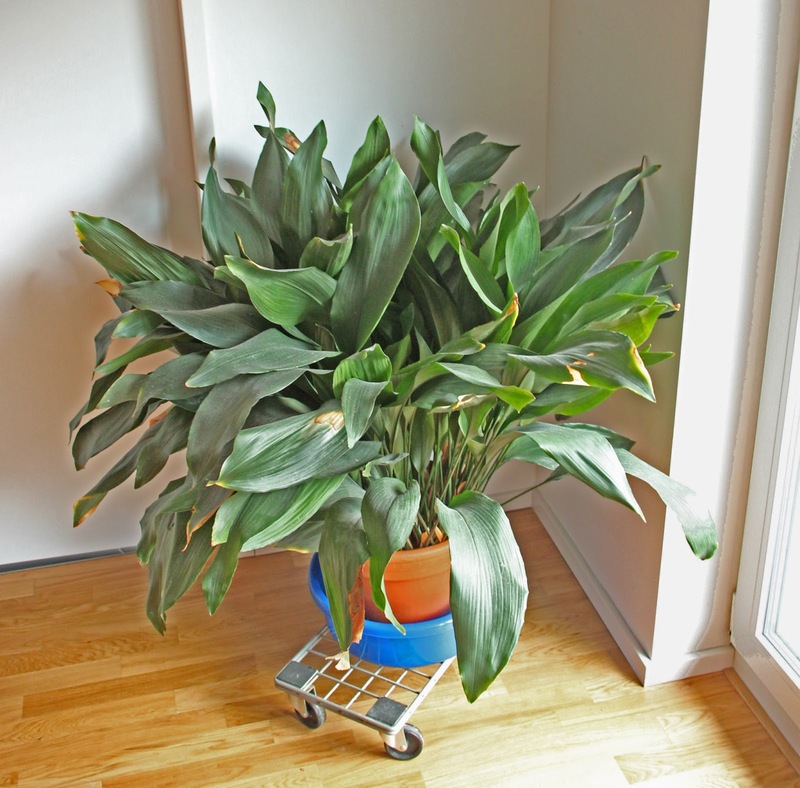 Anyway, aspidistras aside (but see this blog article's epilogue for a short note regarding the odd spelling and pronunciation of their name as featured in Gracie's song but nowhere else), just what are amblypygids? I first learned about them as a child when reading the August 1966 issue of the then-monthly (previously-weekly) British magazine Animals, which contained an article by naturalist R.C.H. Sweeney memorably entitled ''Monsters' of the Caves'. This proved to be an excerpt from his forthcoming book The Scurrying Bush, and told of his encountering these ostensibly unearthly creatures while exploring various large, many-tunnelled caves in Tanzania's Mkulumuzi Gorge. 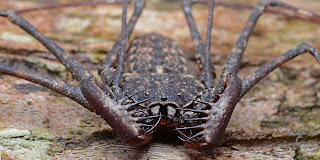 Also known as tailless whip scorpions, amblypygids are arachnids related to the vinegaroons or tailed whip scorpions, but they look more like exceedingly long-limbed spiders, albeit of the kind from which nightmares are spawned. In reality, however, they are basically harmless, lacking both a sting and venom fangs, though they can give quite a nasty bite with their chelicerae (the principal, inner jaws of arachnids) or nip with their pincer-bearing pedipalps (the outer jaws of arachnids). 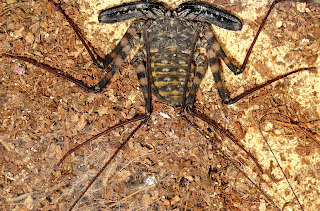 Whereas the vinegaroons earn their tailed whip scorpion appellation primarily from their long whip-like tail or flagellum, the amblypygids earn their tailless whip scorpion counterpart not just from the fact that they lack any such tail but also from their specialised first pair of limbs, which are exceptionally long and slender (as they also are but to a much lesser extent in vinegaroons), thereby possessing a fanciful resemblance to whips (even though they are not utilised in any comparable manner to such implements). 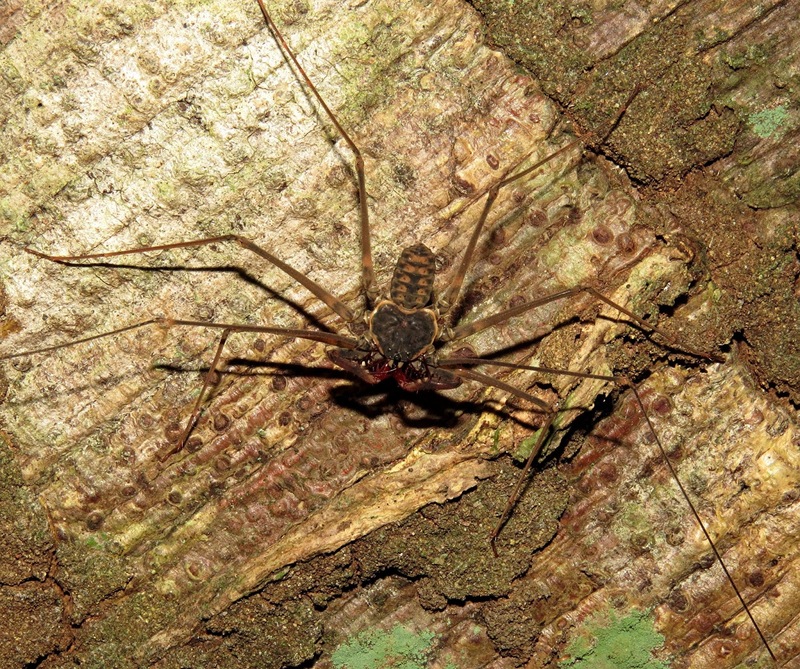 Indeed, their 'whip limbs' are so inordinately elongate (even by normal amblypygid limb standards!) that they can measure up to several times the length of their entire body, and are so fragile that they readily snap off. 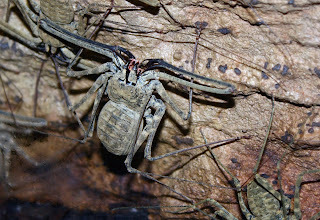 Coupling their whip limbs with these extraordinary arachnids' spider-like overall outward appearance, amblypygids are sometimes loosely dubbed whip spiders, but in reality they constitute an entirely separate taxonomic order of arachnids (Amblypygi) from true spiders (Araneae), just as tailed whip scorpions (Thelyphonida) do from true scorpions (Scorpiones) (again, these latter two groups are superficially reminiscent of one another externally, this time due primarily to the posterior tail-like flagellum of the tailed whip scorpions recalling the posterior sting of the true scorpions). And as if matters of taxonomic identity and affinity were not confused enough already by now in relation to amblypygids, they are also often mistakenly thought by laypeople to be allied to insects! The reason for this ostensibly strange assumption is due to a behavioural quirk they exhibit that is unique to whip scorpions among arachnids but is a major characteristic of insects. For whereas virtually all other arachnids move using all eight limbs, the amblypygids run (very rapidly) and scuttle around only on six legs (just like insects), with their whip limbs, far too fragile and lengthy to be able to function as locomotory limbs, held upwards and outwards. 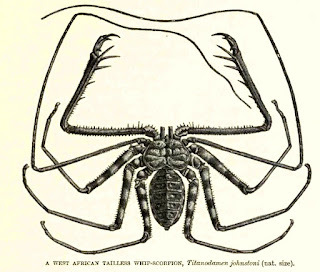 In fact, their whip limbs are actually used as tactile sensory organs, stretched out fully to make contact with their surroundings amid the stygian environment in which these arachnids usually live (and in which eyesight is rendered largely obsolete, despite their possessing eight simple eyes). 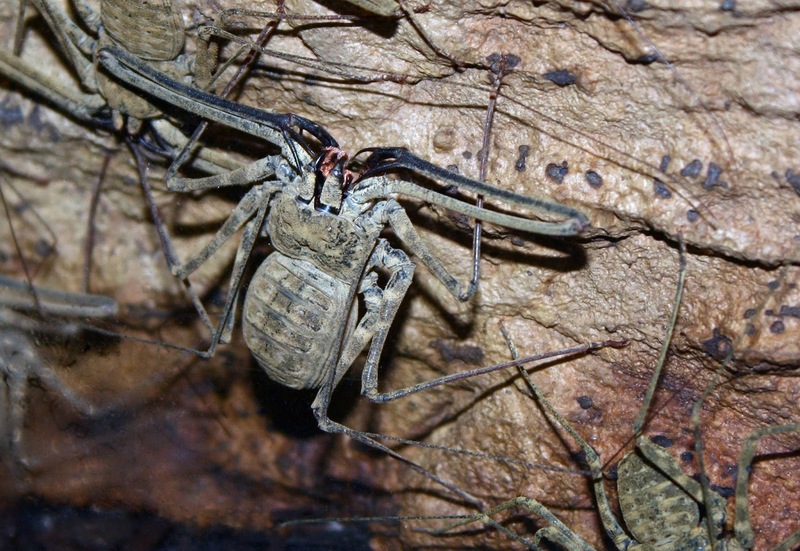 This activity provides their amblypygid owners with detailed information concerning obstacles, the nearness of walls, and the width of cracks in walls or other surfaces into which they can squeeze their wafer-thin, dorsoventrally flattened body in order to escape or remain hidden from potential predators. In short, their whip limbs fulfil a similar function in terms of gauging distances and widths of potential escape routes to the antennae of insects, and the whiskers or vibrissae of certain mammals, such as cats and rodents. 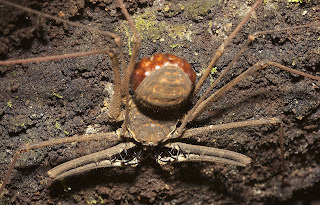 They are also used to 'feel' for prey (mostly arthropods, including other amblypygids occasionally, but also small vertebrates sometimes), which once detected is rapidly seized by their much stouter and more powerful outermost pair of mouthparts, the pedipalps. 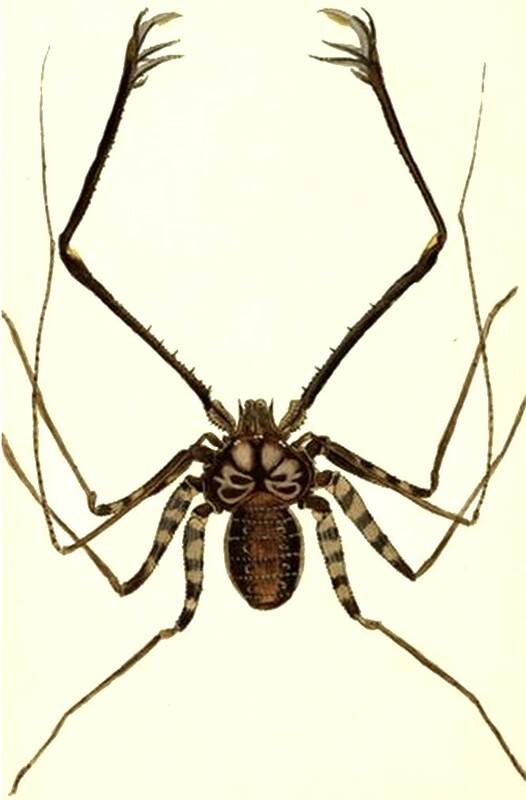 These in turn hand the prey to, then hold it firmly in place for, the chelicerae to macerate into liquid form for sucking into the mouth and thence the gut. 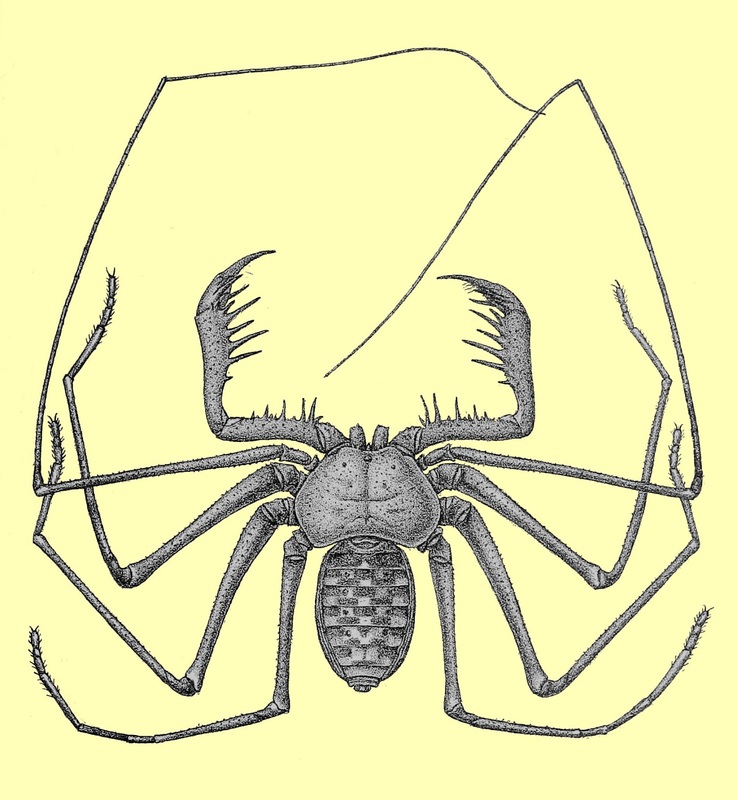 In amblypygids, their pedipalps are also very long (albeit far less so than their whips), with a series of thorny spines running along their inner edge, and each pedipalp bears at its tip a noticeably large, powerful pincer for firmly grasping hold of prey, similar in basic appearance to the chela of a large crustacean such as a crab or lobster. Just like theirs, moreover, these can also inflict a not-insignificant skin-puncturing nip to unwary, intrusive fingers, or noses, of anything posing a threat to the amblypygid. 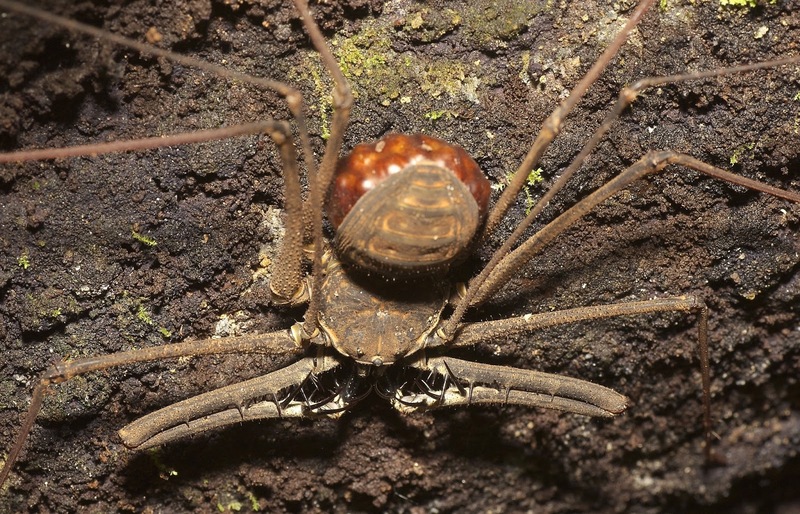 When the latter is at rest, however, its pedipalps are held directly in front of, and at right angles to, its mouth, folded back upon themselves. 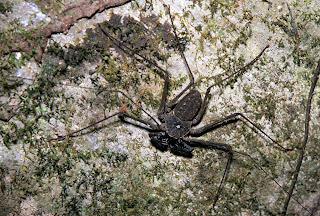 Over 150 species of living amblypygid have currently been described (plus various fossil forms dating back as far as the Carboniferous Period, over 300 million years ago), and they collectively occur in many tropical and subtropical regions of the world including Africa, Asia, Latin America, and Australia, but due to their reclusive behaviour these arachnids are rarely seen unless specifically searched for, because they are all nocturnal and also spend much of their time concealed in leaf litter or inside cracks or crevices within tree bark or the walls and roof of caves – unless moulting. 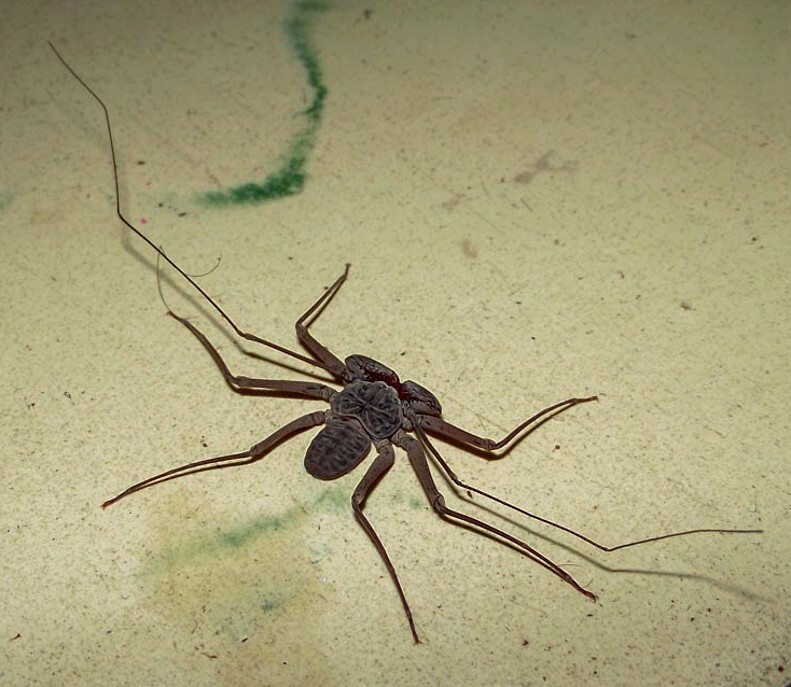 For during moulting, which happens several times during their lifetime, amblypygids normally hang downward from cave roofs or other raised surfaces, shedding their old exoskeleton down onto the ground and remaining suspended until their new exoskeleton hardens and darkens. 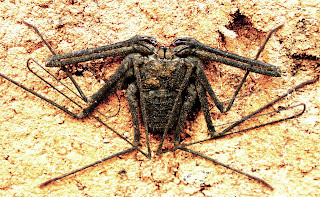 Needless to say, however, anyone encountering at close range such a bizarre-looking creature within the shadowy gloom of a cave or other dark abode but unfamiliar with their nature could be forgiven for barely suppressing a shriek of horror, especially if the amblypygid in question is one of the more substantial species. 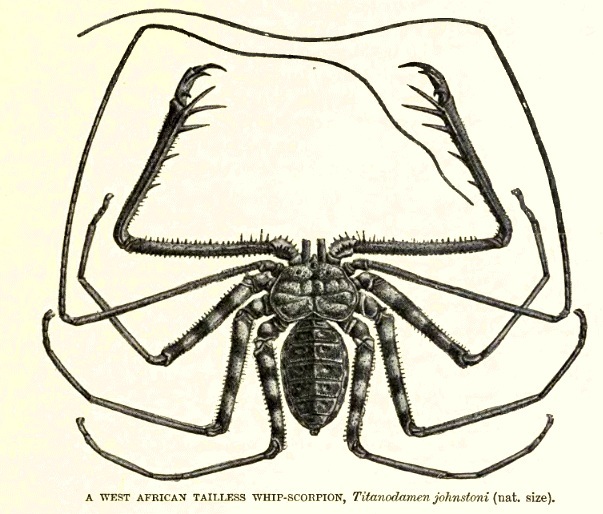 Even the normally redoubtable American zoologist, cryptozoologist, and animal collector Ivan T. Sanderson freely confessed in his book Animal Treasure (1937), detailing his collecting of animals in West Africa, that he personally considered these particular arachnids to be loathsome and nightmarish. As they are certainly frightful in form, albeit quite innocuous in nature, and given that if encountered unexpectedly in the wild they are liable with their extended whip limbs to stroke the face of anyone peering unwarily close to them, it is not difficult to understand his view. 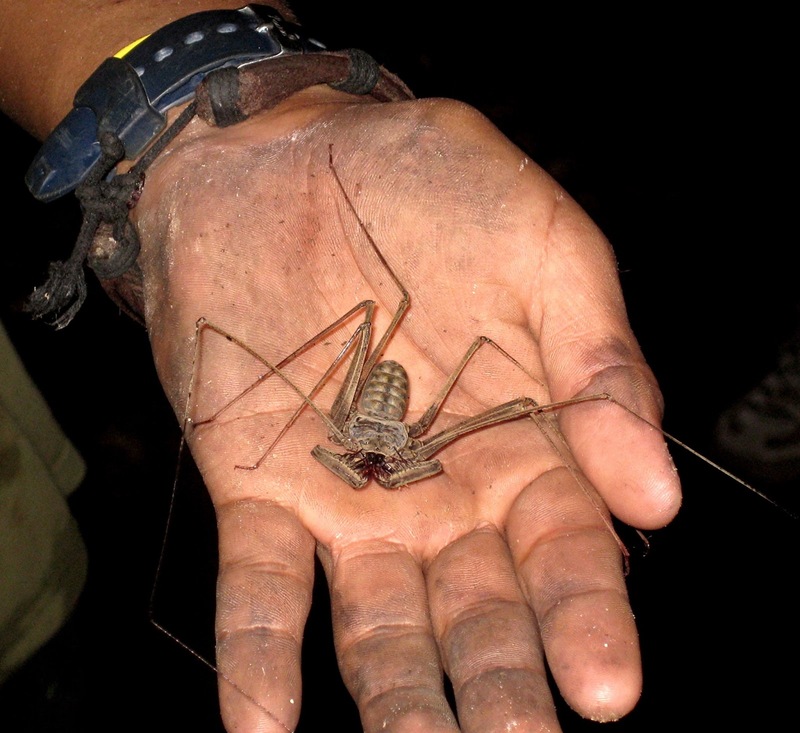 As for size, just how large are the largest amblypygids? 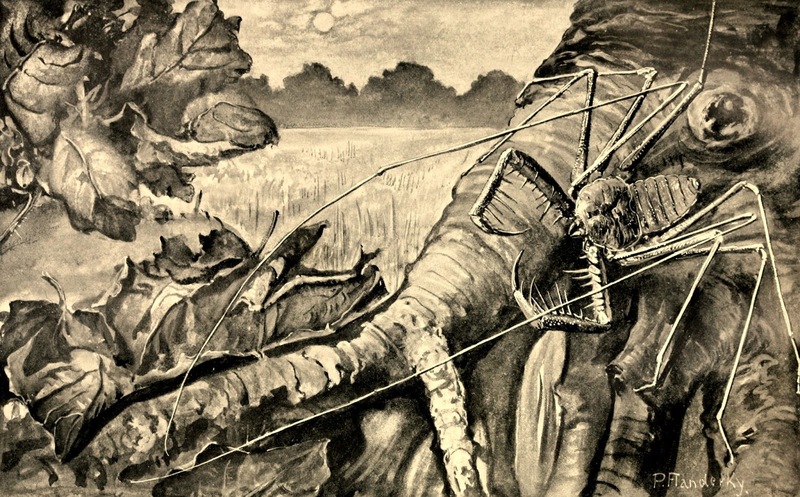 This question leads us into potentially controversial territory, because the most sizeable species have sometimes been referred to as the largest of all living arachnids. However, this claim is by no means as straightforward as it may initially seem, because 'largeness' is not a quantifiable property of an object. The length of an object can usually be directly measured, using various systems of unit, including the imperial system (inches, feet, yards, miles, etc) and the metric system (millimetres, centimetres, metres, kilometres, etc). So too can an object's weight, via units such as ounces, pounds, stones, and tons (in the imperial system), and milligrams, grams, kilograms, and tonnes (in the metric system). The same is also true of its area and its volume. But how do you measure its largeness – what units of largeness exist? There are no such units, because largeness is a subjective, abstract concept, not an objective, quantifiable, measurable property. Consequently, when something is said to be the largest example of its kind, it is often something that is both the longest and the heaviest of its kind – but there are many instances when the longest of its kind is not also the heaviest. So which is then the largest – the longest of its kind, or the heaviest? If the heavier of the two contenders also exhibits a sizeable length, we tend to favour the heavier when talking about the largest, simply because visually it is more impressive. 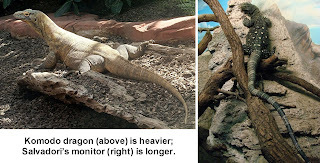 This is why, for instance, the much heavier but shorter Komodo dragon Varanus komodoensis is deemed the world's largest species of lizard, rather than Salvadori's monitor V. salvadorii, which is longer but much lighter. But again, there are exceptions, and if surface area considerations are also taken into account the situation becomes even more complex (should the African plains elephant Loxodonta africana really be deemed the largest land mammal, for example, rather than the much taller and more visually impressive yet much lighter giraffe Giraffa camelopardalis, and how do their respective surface areas compare? ), thereby making judgements concerning the largest of anything fraught with difficulties and inconsistencies. 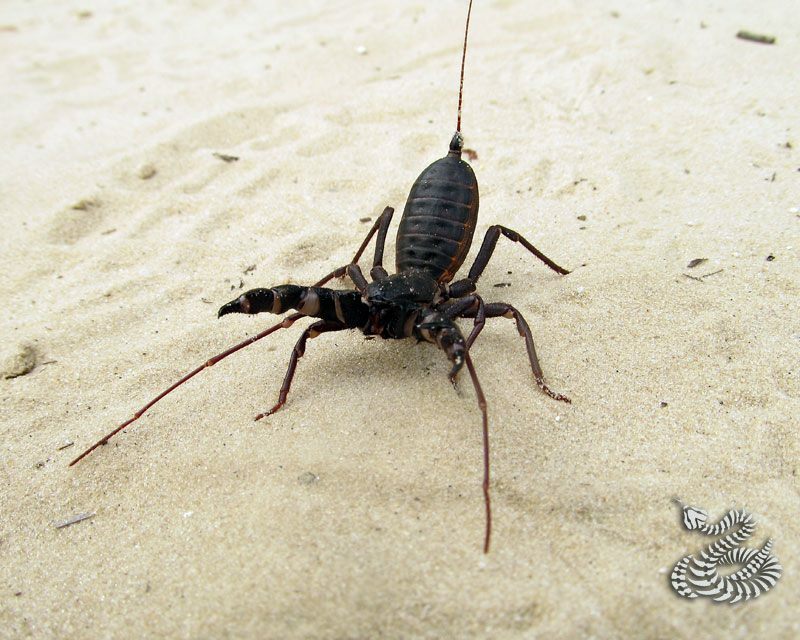 So, applying this to arachnids, it can be readily appreciated that we can easily quantify which is the longest species of living arachnid (India's giant forest scorpion Heterometrus swammerdami, up to 11.9 in long), and the heaviest species of living arachnid (northern South America's goliath bird-eating spider Theraphosa blondi, up to 6.2 oz), but not the largest species of living arachnid. The reason why those particular amblypygids with the longest, heaviest bodies among such arachnids have also been called the largest species of all living arachnids is that when their whip limbs are fully extended laterally, the span from whip-tip to whip-tip is far greater than the leg span of any other arachnid when its longest legs are similarly extended laterally. 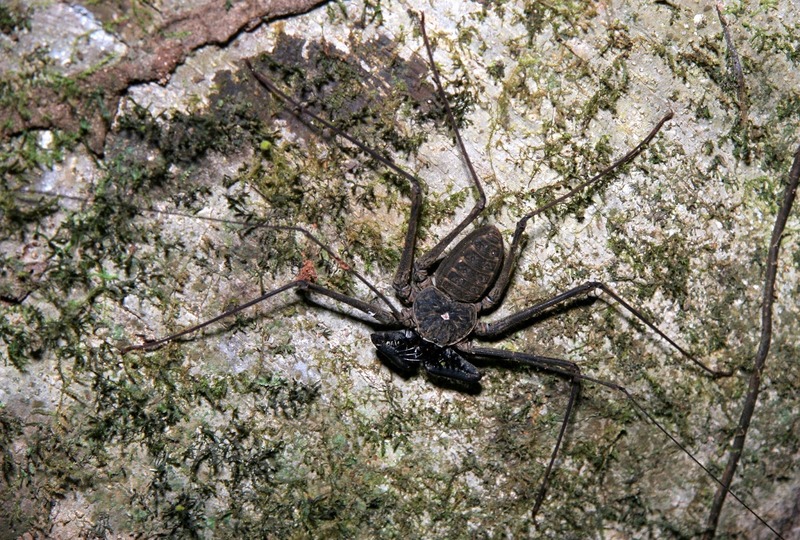 The amblypygid record-holder in this capacity is Acanthophrynus coronatus, inhabiting caves in Central and northern South America, with specimens boasting an extremely impressive fully-extended whip-tip to whip-tip span of up to 27.6 in, and able to prey upon lizards and frogs comparable in size to itself – it truly is the biggest amblypygid in the world! It is also famous for stridulating with its chelicerae. 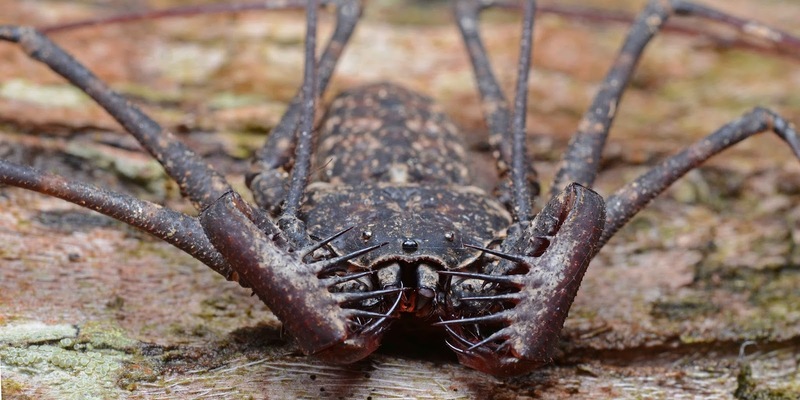 However, the body length and especially the body weight even of these most substantial of amblypygids are still much less than those of the most sizeable scorpions and spiders. All of which leads very conveniently to a question that I've been asked on more than one occasion by fellow fans of the Harry Potter series of movies. In Harry Potter and the Goblet of Fire, bringing to the big screen the eponymous fourth novel in J.K. Rowling's celebrated Harry Potter heptalogy, during a lesson at Hogwarts in which the three Unforgivable Spells are being demonstrated, the teacher in question, ostensibly Alastor 'Mad-Eye' Moody (though in the climax of the book and movie it is revealed that this is not Moody at all but is in fact Barty Crouch Jr impersonating him using Polyjuice Potion), applies the spells to what many viewers have simply assumed to be a made-up, non-existent spider-like monster, but which is actually an amblypygid. 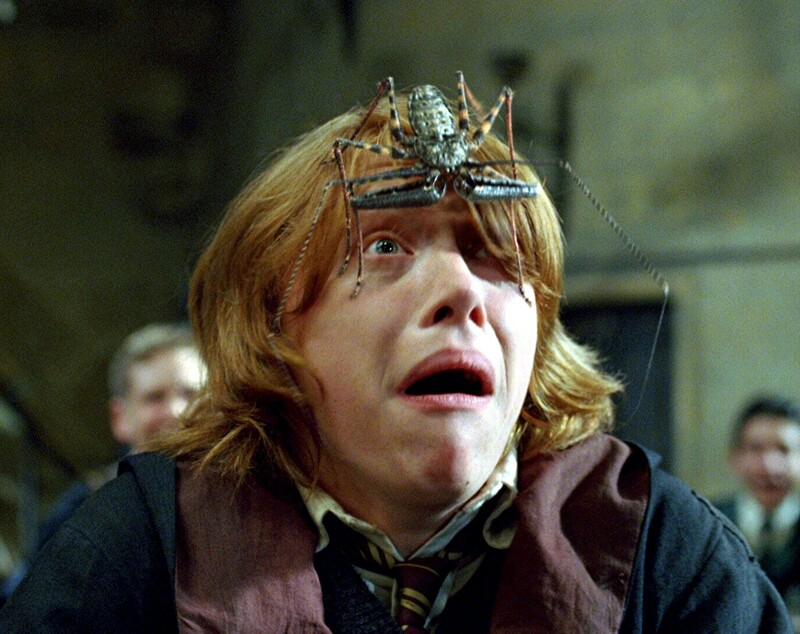 It is also placed on pupil Ron Weasley's head - much to Ron's evident horror! 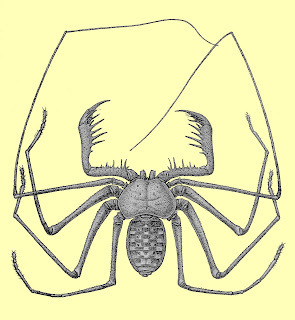 However, this amblypygid is far larger in every way – body length, body width, and limb length – than even the mighty A. coronatus. How is that possible? 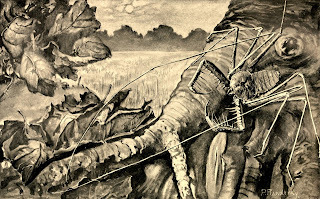 In fact, this very imposing on-screen amblypygid was entirely computer-generated – during which process the fundamental form of a real amblypygid was recreated, but with its proportions greatly enlarged in order to make it look more monstrous. Finally: it may come as something of a surprise to ShukerNature readers who were not previously familiar with amblypygids, but these somewhat alienesque arachnids can be obtained through the pet trade and actually make good pets, although the most commonly-kept pet species is Damon diadema from Tanzania; the much bigger A. coronatus does not fare well in this capacity and therefore is not generally available commercially. As long as they are well-fed and suitably housed in large glass enclosures with all environmental requirements (especially temperature, humidity, substrate, and hiding places) fully met, amblypygids are generally quite docile, much more so than any other type of large arachnid. And the moral of this incident? Never antagonise an amblypygid! Yes, I am indeed aware that on both the original 78 rpm record and the sheet music to the afore-mentioned Gracie Fields comedy song from 1938, the name of the titular plant was spelt 'Aspidastra', not 'Aspidistra', and that Gracie even pronounced it that way when singing the song. Nevertheless, this spelling and her pronunciation were incorrect, but nowhere have I been able to discover how and why such an error arose, nor why it was perpetuated and never corrected. 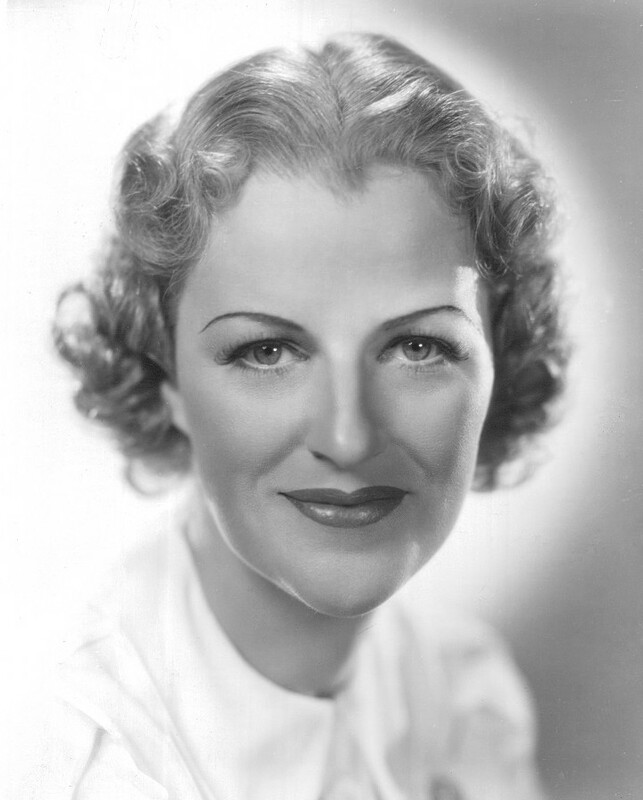 And as Gracie herself passed away in 1979, it may well remain a mystery indefinitely. 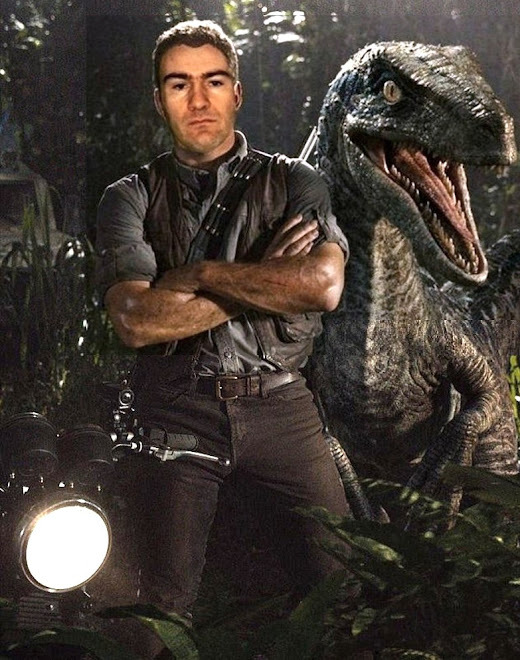 Hello Karl, i am a fan of your blog and the many interesting species you often talk about here. Amblypygids are very interesting to me because of my first encounter with them, which was much less pleasant than yours. My family lives in rural Mexico, and when i was a kid i was used to having to kill scorpions or spiders than wandered into the house, so the day i suddenly saw what could only be some unholy mix of a spider and a scorpion hanging on the wall of the shed outside my house my only reaction was that i had to kill it before it had a chance to kill me. So i tried to kill it with a shoe, but missed (they are quite fast as you noted), so i did the only sensible thing and ran the hell away, convinced that it would try to get revenge on me. And sure, a couple weeks after that i ran into it again, at night, this time hidden under the stairs inside my home, unfortunately for it and lucky for my mental stability, this time i was able to kill it. 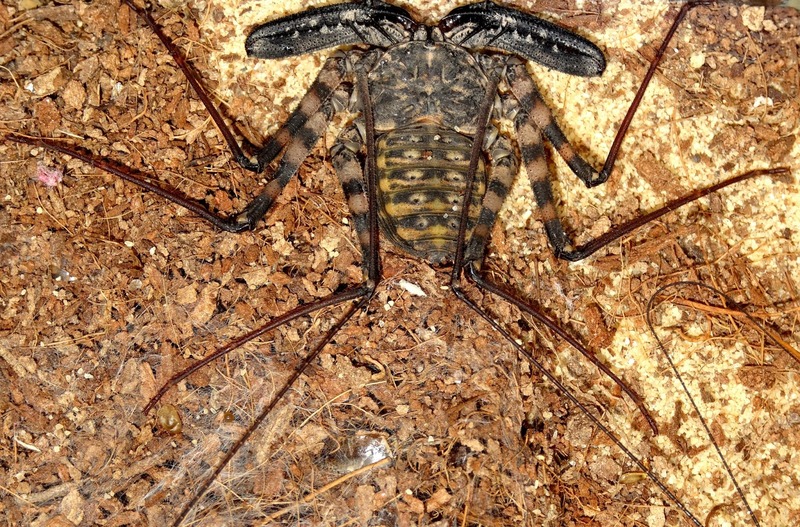 For many years i was unsure of its nature, until i found a picture of a whip scorpion sometime during highschool, from there it was easy to track its real identity as an Amblypygid (I was pleasantly surprised to be able to identify it when it appeared on HP a couple years later). Knowing what i know about them now, i regret killing it, it is a sad fact of human nature that our first reaction to the strange and unknown its fear.